(CNN) -- Jon Opsahl said he doesn't think domestic terrorist-turned-housewife Sara Jane Olson served nearly enough time for his mother's murder, but he's relieved the saga ended with Olson's Tuesday release from prison. Sara Jane Olson was released from a California prison Tuesday after serving seven years. 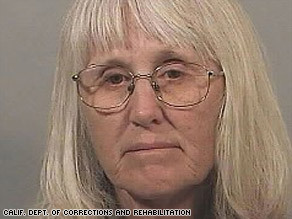 Olson, a member of the self-styled revolutionary Symbionese Liberation Army -- perhaps best known for kidnapping Patricia Hearst -- was released from a California prison after serving seven years, the California Department of Corrections and Rehabilitation said. She was released to her husband just after midnight and is expected to serve her yearlong parole term in Minnesota -- over the the objections of police unions and Minnesota Gov. Tim Pawlenty. Her sentence stems from her involvement in the 1975 attempted bombings of two police cars and the slaying of Myrna Opsahl during a bank robbery that same year. Back then, Olson went by her birth name, Kathleen Anne Soliah. After her 1976 indictment in the attempted bombings, she changed her name and started a new life in St. Paul, Minnesota. She was not apprehended until 1999. "I've really got nothing to say. She did her time, as minimal as that may have been," said Jon Opsahl, who was 15 when his mother was killed. "One of those years -- just one -- was for the murder of my mom and the bank robbery up in Carmichael." Myrna Opsahl, a mother of four, was depositing money at the Crocker National Bank for her church when she was shot by Olson's co-defendant Emily Montague Harris, according to court documents. Harris was sentenced to eight years; she served four and was released on parole in February 2007. Jon Opsahl, now 49, said he never understood why it took so long to bring his mother's killers to justice. While charges were filed in the bombings within months, no charges were brought in his mother's murder until 2002. "You expect thugs to do what thugs do, but you don't expect the district attorney to turn a blind eye to the murder of an upstanding citizen," Jon Opsahl said Monday. Olson's release Tuesday will cap an oft-strange storyline that spans more than three decades and which saw Olson wear the hats of college student, 1970s radical, housewife and philanthropist. Attorney Andy Dawkins met Olson, now 62, shortly after she moved to St. Paul through friends in the reggae band, Pressure Drop. Fred Peterson, Olson's husband, played trumpet in the band, Dawkins said. "She did good deeds everywhere. She raised three wonderful daughters. It was always a shock to all of us that the Sara we know had that past," Dawkins said. After attending the University of California, Santa Barbara, Olson moved to Berkeley in the early 1970s. There, she met Angela Atwood in 1972, and the two became best friends and roommates, Olson told L.A. Weekly in a 2002 interview shortly before she was imprisoned. After Atwood and five other SLA members were killed in a 1974 gunfight with the Los Angeles Police Department, Olson appeared at a memorial in Berkeley's Ho Chi Minh Park to eulogize her friend. "SLA soldiers, although I know it's not necessary to say, keep fighting. I'm with you, and we are with you," Olson told the crowd. Almost a year later, Olson took part in two bank robberies to help fund the SLA, according to court documents. During the Carmichael robbery, Olson "entered the bank with a firearm and kicked a nonresisting pregnant teller in the stomach. The teller miscarried after the robbery," the documents said. In August 1975, Los Angeles police found homemade bombs under two squad cars. They were designed to explode when the car moved, but neither device detonated. Authorities cast the attempted bombings as payback for the bloody shootout that left Atwood and other SLA members dead. A probe into the gunbattle helped police arrest Hearst, the granddaughter of publishing mogul William Randolph Hearst, who claimed she had been kidnapped, raped and brainwashed by the SLA. In her book "Every Secret Thing," Hearst put Olson at the center of the Carmichael robbery. Olson soon left California. According to the U.S. Department of Justice, "she evaded capture for 23 years, and in the meantime, became a doctor's wife, mother of three, community volunteer, veteran of charity work in Africa and practicing Methodist living in an upscale neighborhood in St. Paul." Though authorities said a 1999 "America's Most Wanted" episode marking the 25th anniversary of the L.A. shootout led to Olson's arrest, the show's Web site mentions neither Olson nor Soliah among its almost 1,100 "captures." Her Minnesota friends and neighbors were shocked, even incredulous, when she was arrested. They pleaded with a judge to grant her bail. The Sara Olson Defense Fund began selling cookbooks, titled, "Serving Time: America's Most Wanted Recipes." It would help that Olson was generous with her time. She was active in the church. She volunteered for political campaigns. Dawkins said he had a blind client to whom she used to read The New York Times. Olson's philanthropy, coupled with the connections of her husband, a respected emergency room doctor, made raising the $1 million bail relatively easy, said Dawkins, who remembers that some members of the community had so much faith in Olson they put up their children's college funds. On October 31, 2001, Olson pleaded guilty to two counts of attempting to ignite a destructive device or explosive. She later tried to rescind the plea, saying "cowardice" prevented her from telling the truth. A superior court judge, however, denied her request and in January 2002 sentenced her to 20 years to life in prison, a sentence the parole board later reduced. Olson was charged with Opsahl's slaying that same week and pleaded guilty in 2003 to second-degree murder. Olson received a sentence of five years to life. The California Department of Corrections and Rehabilitation said in a statement that Olson's sentence was reduced for good behavior and for her work on a maintenance crew that cleaned the main yard of the Central California Women's Facility in Chowchilla. Dawkins said "it's right" that Olson served time, but he is glad she is being released. He expects many hugs await her in St. Paul and that she will soon be back to her generous ways. "I really believe who we knew in St. Paul was the true Sara Olson," he said. The Los Angeles Police Protection League disagrees and has loudly opposed her early release. Sgt. Paul Weber, the league's chief, called her a sociopath who "never said she was sorry." He also lashed out at those who rush to defend her. "Enough with the BS that she was unfairly targeted by law enforcement for her youthful indiscretions -- she is a criminal," Weber said in a Monday statement. Corrections officials say it's important that she be reunited with her family during her parole -- it helps reduce recidivism -- but Minnesota legislators, the governor and the St. Paul Police Federation have asked Gov. Arnold Schwarzenegger to keep her in California over the next year. "Letting a domestic terrorist like Kathleen Soliah set the terms of her parole is an insult to the memory of Myrna Opsahl and all the men and women of LAPD past and present," the St. Paul union said in a letter last week. Jon Opsahl, however, just wants to put Olson out of his mind. "Get her out of here," he said. "I don't want to see or think about her again."